The results of a new set of compulsory national tests for children in the final year of primary school in England are being published. But how are they different from the old tests? Why do we have new national tests? The tests sat by primary school children this year are new because they are the first to test the new national primary curriculum. This covers different material from the old one and has been taught in schools only since 2014. Therefore a totally new set of tests has been developed to measure attainment in three subjects; maths, reading, and spelling, grammar and punctuation. Writing is evaluated separately by teacher assessment. The tests are taken in Year 2 and Year 6, but only the tests taken by 11-year-olds are marked externally. Department for Education officials are keen to stress that these new tests are not comparable to those taken in previous years. The new primary curriculum was drawn up to be deliberately tougher than the old one, and is described as a "knowledge-based curriculum". Therefore, the tests themselves are tougher than they have been in recent years. This was a conscious decision by ministers seeking to raise standards. 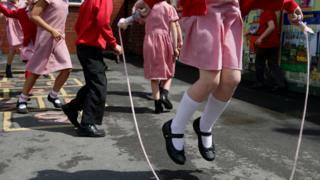 They argued that the standards expected of pupils at the end of primary school had not been high enough. Previously, attainment at the end of Key Stage 2 was measured in Levels - Level 4c being the expected standard for pupils in their final year of primary school. In the new tests, the expected standard is measured completely differently. The expected level is set at 100, but scores can range between 80 and 120. Effectively, anything at 100 or over is a pass and anything under is a fail. This year, panels of teachers set the actual mark on individual test papers required to meet the expected standard. This is based on a series of key performance indicators within the national curriculum. No. DfE officials describe it as a "year zero". The tests are measuring pupils' knowledge of a new curriculum - even if they have been studying it for only two years. And the standard is higher. However, it is understood the expected standard is broadly equivalent to a Level 4b. In the old system, this meant children working securely within Level 4 with its set of competencies. Last year, in maths 87% of pupils reached Level 4, compared with 77% of pupils reaching Level 4b. In reading, 89% reached Level 4 and 80% reached Level 4b. The DfE will release a set of figures representing the national average result. It will show the percentage of pupils nationally working at 100 in reading, maths and spelling and grammar. It will also give the percentage of pupils working at 100 in all three subjects. Bearing in mind the raising of the expected standards and the fact that pupils have been studying this new curriculum for only two years, a lower percentage of pupils are likely to reach the all-important 100 mark than reached the old Level 4. The fact that teachers and pupils were grappling with a completely new set of tests, with fewer practice papers, is likely to mean pupils will not do as well this year as in later years. There have also been complaints from teachers and heads that some of the questions on the papers were harder than expected. Ultimately, the results of the tests will be used to hold schools to account for the attainment of their pupils and the progress that they make. Progress is measured by the distance of travel between the tests taken at the end of Key Stage 1, sat by seven-year-olds, and the results of those taken at age 11. Head teachers have argued that this year's results should not be used to measure schools' achievements because of the likely volatility in the system. Ministers have rejected that, and Education Secretary Nicky Morgan has said that only a maximum of 1% more schools than last year will be allowed to fall below the minimum standards they must meet before intervention happens. In 2016, a school will be above the floor if at least 65% of pupils meet the expected standard in reading, writing and mathematics or the school achieves sufficient progress scores in each of the "three Rs".